The Order: 1886 developer Ready at Dawn’s upcoming physics-based multiplayer arena brawler De-formers is a big departure from the studio’s steampunk flagship title. A multiplatform (PS4, Xbox One and PC) offering published as part of GameStop’s recently announced GameTrust initiative, De-formers, is a mix of lots of elements from beloved games cobbled together into something that looks familiar, yet strangely hard to pin down. This third-person competitive game about a bunch of rolling round creatures trying to knock each other out mixes the bashing mechanics of Super Smash Bros. with the physics-based mayhem of Gang Beats, then combines it with the whacked out controls of Super Monkey Ball and the skill-based shooting of Twisted Metal. It’s bonafide bonkers and about as far away as you could get from the immaculately detailed but ultimately conventional The Order: 1886. Gone are the finely groomed yet gritty action action heroes, the glistening rain-slicked cobblestone alleys, and the sputtering crackle of archaic 19th century firearms. 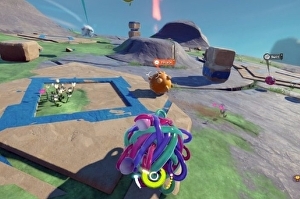 Instead De-formers focuses on freakish, spherical amphibians trying to obliterate each other in brightly coloured play pens.